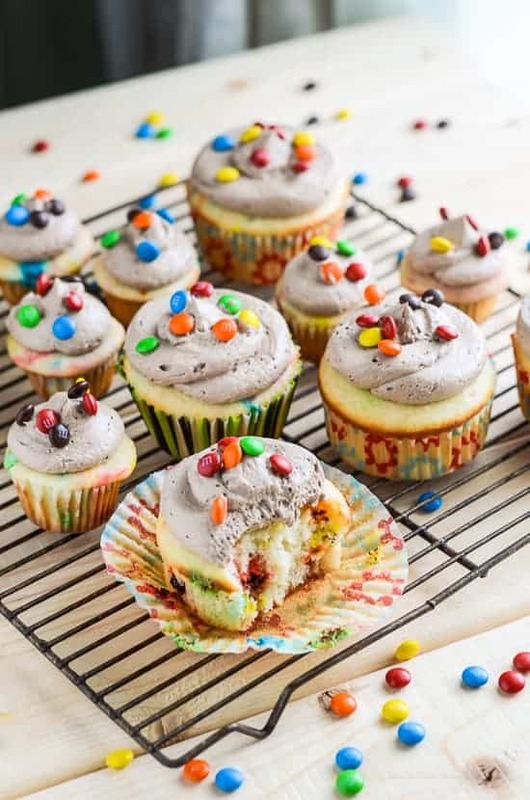 You’re never too old to love M&Ms, and these Easy M&M Cupcakes are made for all ages! I have extreme baby fever. It’s kind of hard not to, you know? Soooo many of my friends (both online and in real life) are either pregnant, newly mothered (is that a word? ), or on their second or third. And here I am, waiting patiently until the beginning of next year for Mr. Crumby and I to start trying. I never expected that I’d be having children post-30. As a matter of fact, I never really thought I’d be planning out when to start! I just imagined it would happen when the time was right. Funny how ideals change. My batting average on my young adult life priorities list is pretty low, but the “happily married” and “solid career” parts count for a hell of a lot in the long run. I must say, this baby fever elevates to heights you wouldn’t believe at back to school time. The very notion of getting my little ones ready for a new school year brings such a bittersweet yearning to my heart. Fresh packs of papers, loaded up in those shiny folders. The smell of a new box of crayons. The cutest stinkin’ lunch boxes I’ve ever seen (and am partially tempted to buy for myself). Waving goodbye, tears pricking the corners or your eyes, as you watch your baby ride off on the school bus to their first day. Surprising my little ones with “Happy Back To School” treats after their long day independently learning and growing. Yeah…I think that may be the happiest thought of them all! Most kids around the US don’t head back to class until the first week of September, after Labor Day. Down here in Florida, most kids start back this week (today in my county! ), so this is a well-timed recipe for all you lucky Mommies out there! This is seriously such an easy recipe! I don’t use box mixes very often anymore, but I’ve discovered that even they can be (almost!) as good as homemade, with some extra additions on top of what the back of the box calls for. Buttermilk and sour cream give it a lift, and a moistness they would be lacking without them, and the vanilla punches up the flavor just a tiny bit. And then, M&Ms of course! Who doesn’t love M&Ms? They’re so fun to eat! 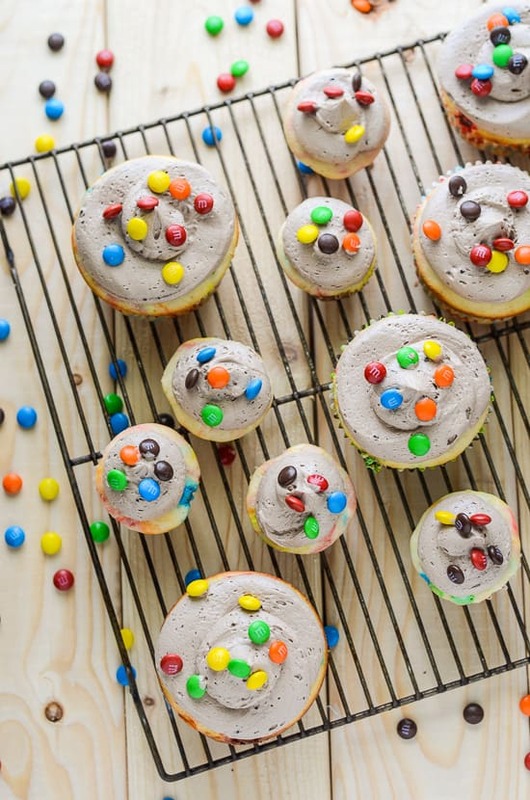 Every bite is a surprise of which color you’ll get, and you’re sure to love them as much as your kids do! 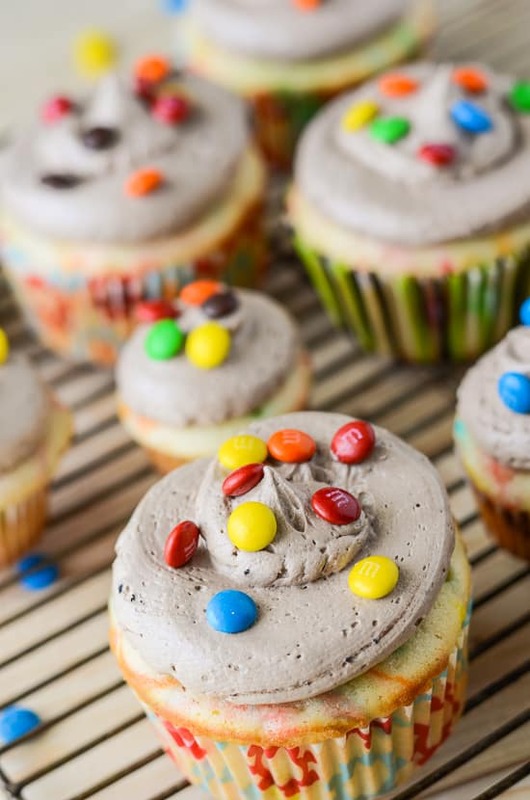 Just in time for back to school, these bright, fun M&M Cupcakes will bring a smile to the faces of young and old alike! 3/4 cup M&Ms Minis NOT the baking bits! Preheat oven to 350 degrees and line cupcake pans with liners (I got 15 large and 14 mini). Combine oil, eggs, buttermilk, sour cream and vanilla extract In a large bowl and whisk until blended. Add cake mix and blend until smooth, being careful not to over mix. Gently fold in M&Ms. 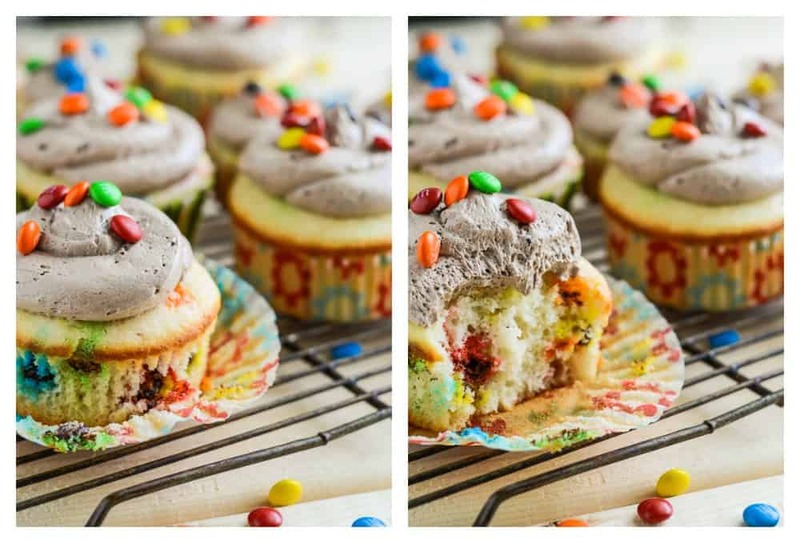 Don't worry about the colors running, it adds to the charm of the cupcake. 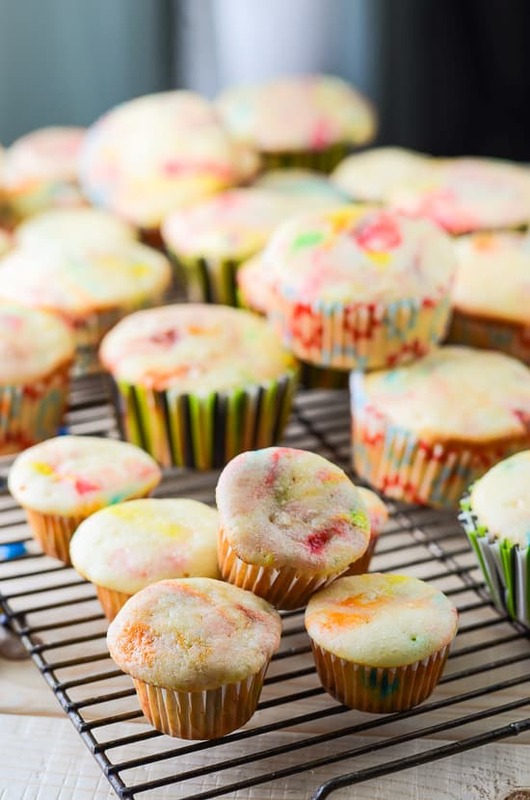 Fill cupcake liners ¾ full and bake for 16-20 minutes for regular sized, 13-16 minutes for miniature, or until an inserted knife comes out clean. Your times will vary. Chocolate Whipped ButtercreamPlace chocolate chips in a microwave safe bowl, and melt in microwave for 30 seconds at a time, stirring with a spatula until smooth; set aside to cool for 15 minutes. In a stand mixer fitted with a whisk, cream sugar and butter on medium speed until light and fluffy, about 3 minutes. Scrape sides of bowl. Add melted chocolate, vanilla and cream, and whip on medium speed for 1 minute more, until incorporated. 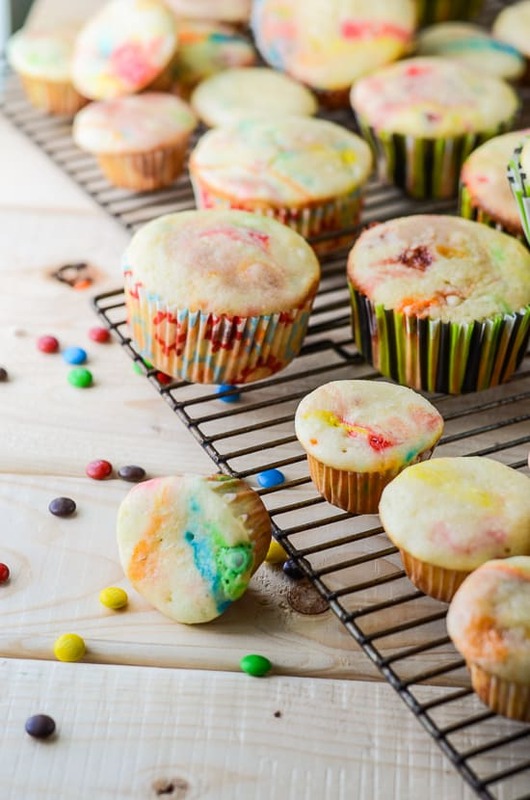 Pipe onto cooled cupcakes and garnish with M&M Minis. Now I want a cupcake for breakfast, is that bad? Those look so yummy and fun! YUM!! I have never had chocolate buttercream frosting, but it looks amazing. You’ll have to try it! I think next time I’ll add more chocolate! Those look amazing! Homemade icing and everything! Pumped up box mix, and homemade icing! Your friends will never know! I can only imagine! LOL! 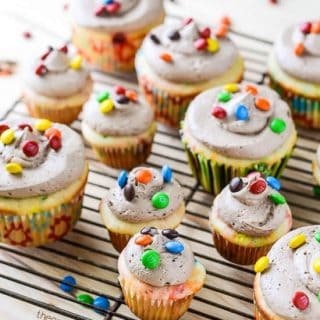 These cupcakes look cute and yummy! Get in my belly!!!!! LOL! These are so cute and look delicious. My mom is a huge M&M fan, so maybe I’ll try to make these for her in the fall. Ship me a box! These look amazing. That is not encouraging! But I just bought my first bottle of prenatals, so I guess I’m diving in headfirst!!! 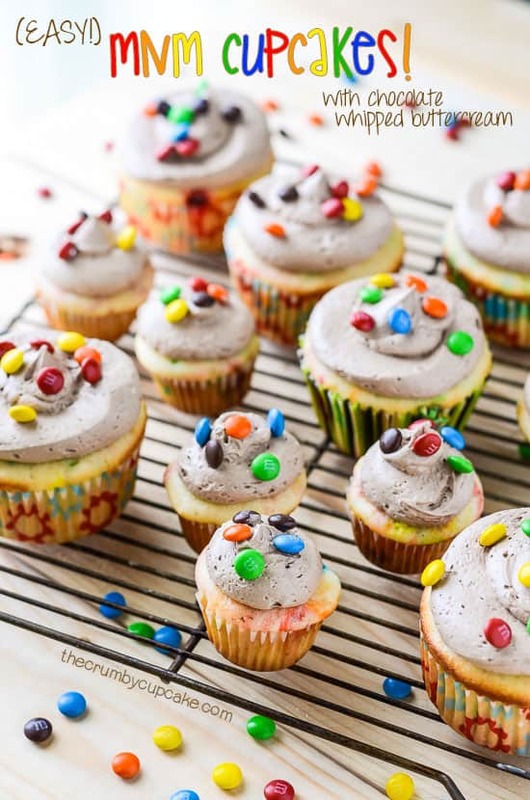 I can already hear my trainer yelling “step away from the cupcakes.” Oh, man, these look so good! They look soo good I can already taste them!!! 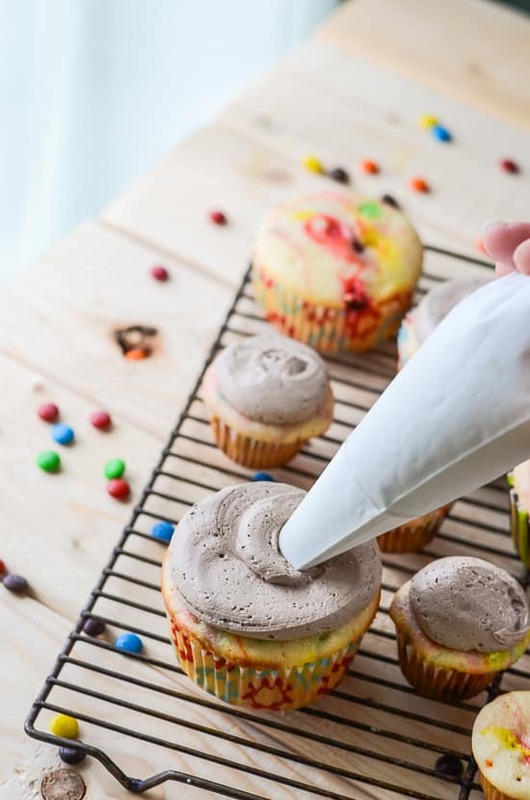 That chocolate whipped buttercream frosting looks amazing! I could go for one (or many) of these right about now! 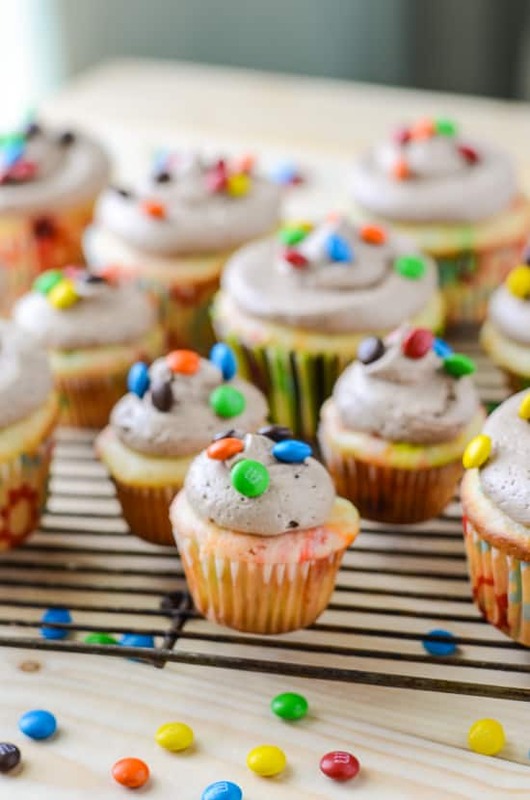 These are so adorable…love that you made different sized cupcakes too! You are right, my kids would devour these!